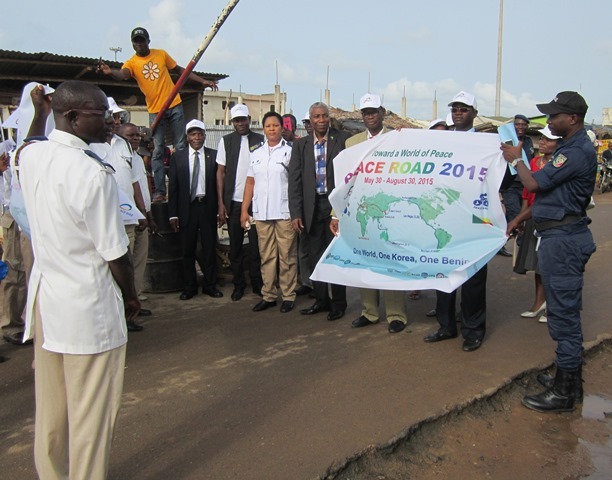 FFWPU Benin: On June 11, 2015, after 5:00 hoondokhae, the Peace Road team of Benin went to the border between Nigeria and Benin. The Peace Road flag from Nigeria was passed to Benin. They organized a special ceremony with government officials of two countries. The Nigeria-side officer was a captain; the Benin-side officer was a commandant. These officers expressed appreciation for Peace Road activity hosted by UPF and FFWPU. It was 8:30. Then, traffic police led cyclists to Benin’s capital Porto Novo from the border. 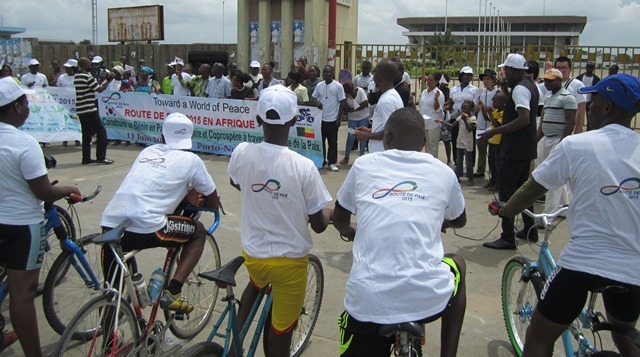 At 10:00, they celebrated Peace Road at the National Assembly building. The representative of the assembly’s president, the director of the cabinet, delivered his message for peace, and signed the banner. They continued traveling to the economic capital of Benin, Cotonou, arriving at 12:00. Again, they celebrated Peace Road with a government representative in front of Stadium Amitie.